Thanks to Madison Union’s Open House Wednesday, September 23rd, students left the occasion as owners of cool prizes, full of free food, and overflowing with free giveaways. Several students even earned bragging rights as winners of Auntie Anne’s Pretzel Twisting Competition. Yes, you read that right – a pretzel twisting competition. From 11 a.m. until 2 p.m., the place to be was Madison Union. The open house introduced returning students to the newest changes in Madison Union, most notably the additions of Commonwealth One, Auntie Anne’s in TDU, the relocation and expansion of the post office, and the new meeting space that now occupies the post office’s former location. Additionally, it gave new students the chance to discover all that Madison Union has to offer as well as the organizations housed within the building. Madison Union held drawings for various door prizes every half hour of the event, with the final grand prize of an iPad Mini drawn at the conclusion of the open house at 2 p.m. In order to be eligible to enter the drawings, students first had to receive stamps from nine locations within Madison Union on an event passport. Using the passports as a guide, students wandered around Madison Union exploring and gathering free swag and stamps along the way, pausing to sample from the food stations at each stop on the map. The delicious delicacies ranged from a fully decked-out nacho bar to mac n’ cheese bites for savory choices, and from paw print-shaped brownies to pumpkin spice flavored cupcakes for dessert. Platters of assorted cheeses, crackers, fruits and veggies also dotted the building, and crab dip even made a brief appearance before being devoured by multitudes of hungry bellies. “It was definitely the free food that lured me in, but now that I know about the cool lounges I’ll definitely be back to study here,” said undeclared freshman Brenna Houck. Thanks to the open house, “I now know more than just where the post office is!” she laughed. DJ Ryan Slocum, a JMU ’14 alumnus, played tunes from the staircase landing between the third and fourth floors, and entertained both levels, filling the air with sensational music that added to the vibrant atmosphere. Across from the Dux Center stood an airbrush tattoo station, where many students eagerly lined up to receive a colorful accessory or two, afterward proudly showing off the tats in pictures to friends. Even Duke Dog didn’t want to miss out on the fun, and attended the open house, where he welcomed students into the building and posed for the pictures that followed. In the midst of all the excitement, students could take a breather in the form of a drop-in yoga workshop, which debuted the new meeting space on the second floor. The workshop was led by Suzanne Perrine, director of The Center, a dedicated yoga and Pilates studio located in downtown Harrisonburg. The open house also coincided with the grand openings of both Commonwealth One and Auntie Anne’s. Commonwealth One used a prize wheel to dole out gifts, which students spun to see which type of free giveaway they would receive. Students also had the opportunity to enter in the drawing for one of the five $100 gift cards to the JMU bookstore at the bank’s opening. “The free giveaways were definitely my favorite part of the event, especially for me because I got a $25 Visa gift card from spinning the wheel at the bank’s table,” said junior Aaron Minnick, a philosophy major. Meanwhile in TDU local band The Judy Chops entertained the lunch crowd with several rousing performances, and hosted a songwriting workshop in between songs. Auntie Anne’s pretzel twisting competition was held in the background, pairing up two students per round to face off in a pretzel twisting battle judged by Auntie Anne’s employees themselves. After a proper demonstration from an employee on how to properly twist a pretzel in one fluid motion, the participants began twisting. The competition alternated between rounds back and forth from whomever could finish their entire batch of dough the fastest to whomever could twist the first three perfect pretzels. All participants received a free Auntie Anne’s t-shirt, while the winners also received an Auntie Anne’s coffee mug or thermos, in addition to bragging rights of course. Junior Ke’Essence Gore loved the chance to participate in the competition, saying “It’s always been on my bucket list to make a pretzel but I never thought I’d get the chance.” The psychology major found out about the competition while in TDU getting a stamp for her passport, and emerged victorious after winning her round. Among other interesting features of Madison Union, several students also discovered the new recliners hidden away next to the Event Management Office down in TDU, which is quickly becoming a popular spot. The goal of the open house was to introduce students to the newest changes in Madison Union, and hopefully encourage them to come back and visit again. Miss out on all the jolly good fun? Don’t worry, this is only the beginning of a new tradition; the Madison Union Open House will now be an annual event that occurs at the start of each school year. 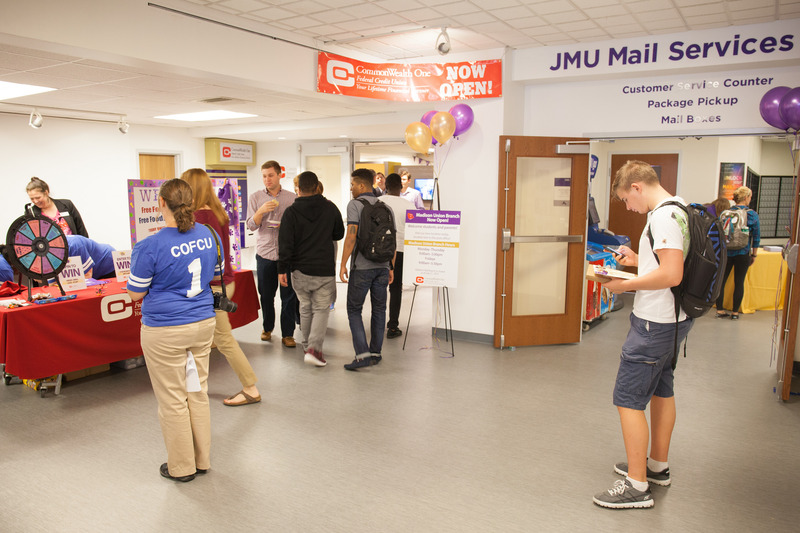 In the meantime, check out the photos from the event on the University Unions Flickr and take a peek at the JMU Calendar at https://ems.jmu.edu/MasterCalendar/MasterCalendar.aspx to learn more about upcoming events in Madison Union!